Harts of Maidstone supply a wide variety of Meeting, Training and Conference solutions from a large number of manufacturers to ensure the correct choice for each application. From Board Meetings to Staff Training, we have the ideal choice for your business in a multitude of fabric choices and styles. 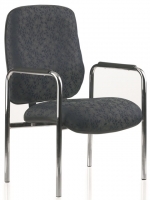 We know that seating takes up space and is not needed all the time, that’s why a proportion of our meeting, training and conference chairs are stackable. Some even have trolleys for ease of movement. All seating is certified to British Standards.